The French owner of this powercat is an ardent diver and deep sea fisherman. "Obsession" services both these marine pastimes in the New Caledonia lagoon and offshore, including Vanuatu. 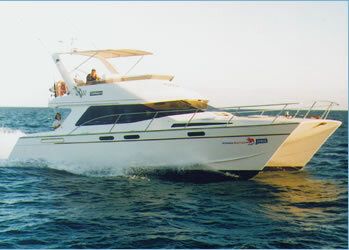 The boats owner and crew have held a number of successes in both forms of watersport. This craft has been used very frequently in its whole life, recording 50,000 nautical miles in the first nine years.